The Costa Brava is the northeastern part of the Spanish Mediterranean coast which belongs to the province of Girona. It extends over a length of 214 kilometers from the French border to the Costa del Maresme, which already belongs to Barcelona. The name "Costa Brava" (Wild Coast) probably derives from the rocky parts of the coastline. There are however also beautiful bays, in which the best known holiday resorts are located. By the middle of the 20th century Costa Brava gained an enviable reputation as one of the Mediterranean's glamour spots. The scenic beauty of the region attracted many artists such as Marc Chagall, Picasso, Rusiñol, Salvador Dali and Hollywood film stars. Today places like Tossa de Mar, Lloret de Mar and Estarit dispose of numerous hotels and leisure facilities, the Coast between Rosas and Tossa de Mar has also a lot of delightful small coastal towns such as Pals, Begur, Tamariu, Aigua Blava and Calella that are not that overcrowded with tourists. The climate at the Costa Brava is influenced by the Mediterranean Sea and is therefore very mild and pleasant. The average temperatures in the summer months range from 21°C to 28°C. In the winter temperatures range from 6°C to 10°C. The water temperature in February is 12°C but during the summer months the water normally reaches a temperature of 24°C. The best time to visit the Costa Brava is between April and October, depending on your preferences. In the summer there are higher temperatures and it is more pleasant to swim in the war water of the Mediterranean Sea but during the Summer months there are also crowds of tourists. With splendid golf courses in the Costa Brava region, many in beautiful locations with manicured, velvet greens perfecting your swing and putting those balls. fronting the dramatic coastline and backed by the Pyrenees Mountains, the Costa Brava golf courses operate all year round thanks to a benign climate. 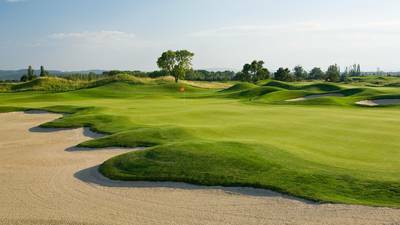 Costa Brava golf green fees are reasonable and tee times readily available. The only decisions you have to make are which courses to choose for those all important leisure hours to get the most from your Spanish golf holiday. Golf on the Costa Brava is heaven-sent competing with old favorites down south as a leading golfing destination, due to the proliferation of championship courses all within a short distance of each other. Book your golf tee times in Costa Brava with Justteetimes.com, your one stop source for online golf tee times and green fees anywhere. Home to two challenging and outstanding golf courses, Emporda is an unforgetable golf experience, get a 2 Round Package today (1 round at Links Course and 1 round at Forest Course).